Over the last three months, Priceonomics has published eight blog posts. Prior to that, no one on our team had any significant experience blogging to promote a startup. 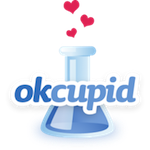 The founders of Priceonomics all agreed that the OkCupid Blog (which is now tragically moribund post IAC acquisition) was one of the coolest things ever on the internet. We admired their approach of using their data to produce unique insights that generated awareness for their company. So, we started blogging. We thought we’d share some stats and a few observations from the experience. All this was completely new information for us, so it might be new and useful for you too. This is not a “how to do startup blogging successfully” post. We don’t really have any generalized principles here or have a clearly defined idea of what “success” even means. Our eight posts were published roughly every 10 days. Each post required approximately 30 to 40 person-hours of work to analyze the data and write the post. One was a guest post, but that required a lot of time investment in editing as well. In aggregate those posts generated over 110,000 visits and approximately 63 media articles covering or mentioning our company. Three of the posts reached the top of the Hacker News and the rest of them made the top five. A note on these numbers: Most of them come from our Google Analytics and are accurate. Some of them come from memory, especially our max rank on Hacker News. It was surprisingly hard to remember if a post reached #4 or #5 on Hacker News a month later even though at the time it was a really exciting event. Also, on our first blog post we forgot to have Google Analytics on that page so the numbers from that post are a best guess. We never figured anyone would read the post really. Below is a chart of the traffic generated from our each of the blog posts. Next to the name of the post is the maximum rank that the post achieved on Hacker News (the posts are also ordered by rank). A top ranking post on Hacker News can generate about 10K visits to your site. However, to get beyond that the post needs to move beyond Hacker News. For each of our posts, the chart below shows how many other media outlets wrote about Priceonomics because of that post. (All the stats + more are available here). According to this metric, our most popular posts by far were Fixie (The Fixie Bike Index) and Phone Resale (Your Phone Loses Value Pretty Fast). The story of how each of these spread and got coverage was very different. When we published The Fixie Bike Index, we emailed and tweeted a bunch of bicycle bloggers and econ bloggers to see if they were interested. We didn’t really get any responses from them initially. Then the Atlantic News Wire picked up the post and used one of our charts as their “Chart of the Day”. From there a bunch of New York based bloggers saw it (presumably over Twitter) and wrote about it. From there it spread throughout the bike community and various newspapers and blogs covered where their city fell on our various rankings. Ultimately, this story spread without us really doing much of anything. On the Caltrain ride home that night, some people (completely unrelated and unknown to us) in the bicycle car were talking about the post and that was a pretty neat feeling. Our most successful post, Your Phone Loses Value Pretty Fast was almost a complete failure. It shot up Hacker News, but it didn’t stick and fell down pretty fast. It was a bit demoralizing because it was by far our most time consuming post to construct and write. We hunkered down and sent in cold emails to some major tech blogs. We got really lucky when Josh Constine at TechCrunch wrote us back telling us he wanted to cover it. After the TechCrunch post an avalanche of other tech sites and mainstream media sites covered our report on the resale values of mobile phones. The next day we checked our Google Analytics and saw bunch of traffic from the corporate networks at Apple, RIM, Microsoft and Amazon. That too felt neat. First off, posts that appeal to the tech crowd are important for us because there are channels built for distributing tech news (Hacker News, Twitter, Reddit) that we can use. If we wrote a post about fashion, we wouldn't know where to start getting exposure. Second, for a story to really take off it has to appeal to a broader public than just tech and hackers. Think to yourself, will my high school friends want to share this on Facebook? 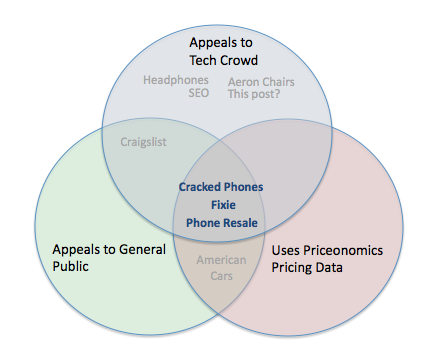 Finally, and most importantly, our most successful posts use Priceonomics data at their core. These posts can be authentically our flavor. If you authentically love what you write about, you'll do a better job and you'll put in more effort. The posts we spent the most time pouring over because we loved the subject matter had the most traffic and media citations. Using our data also makes getting media coverage for us much easier. If you provide interesting data to a journalist or blogger, you don't have to sell him or her on covering your company. You are giving a journalist interesting data and that makes his job easier. On the other hand, if you're just pitching a blogger to cover your company because you exist, you're trying to extract value from them without really providing anything in return - that's an uphill battle. So in short, what Priceonomics learned from three months of blogging was that we should write about our data. That's what worked for us. That, or just mentioning iPhones. Comment on this post on Hacker News. This post was written by Rohin Dhar. Follow him on Twitter here. Get the latest from Priceonomics on Facebook or Twitter.